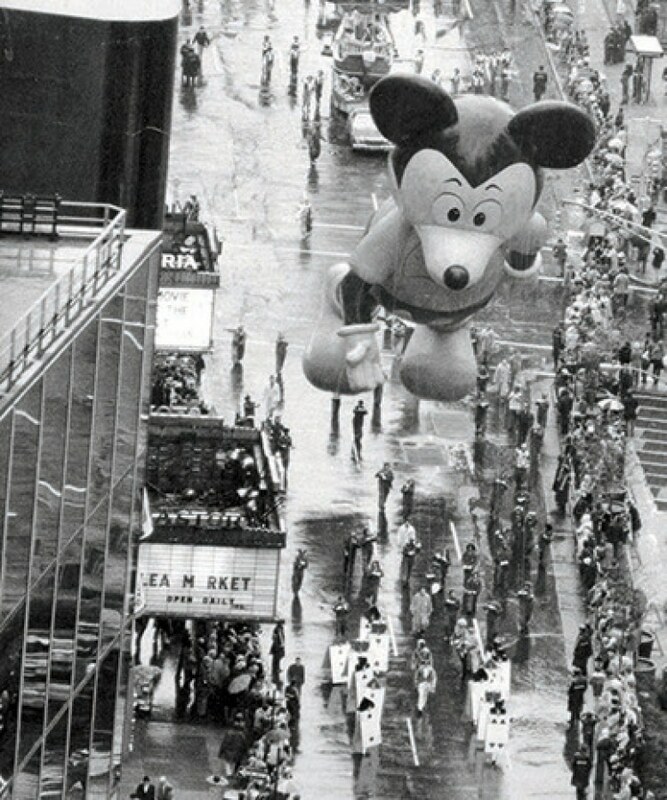 In pondering an exhibit to do for Thanksgiving week, I thought it might be interesting to check out what the Macy’s Thanksgiving Day parade looked like the year I was born: 1975. As disappointed as I was that I missed both the absolutely bananas Planet of the Apes float, promoting the very brief television series featuring Roddy McDowall (1974) and the Bicentennial extravaganza (which doubled as the 50th anniversary celebration of the Macy’s parade) in 1976, the 1975 parade still has a lot on offer. In a present-day era where the parade seems to provide cheesy tie-ins to every major multimillion dollar movie series, cartoon, or musical artist, it’s intriguing to look at how more modest, even bespoke marketing campaigns used the parade to launch their products. 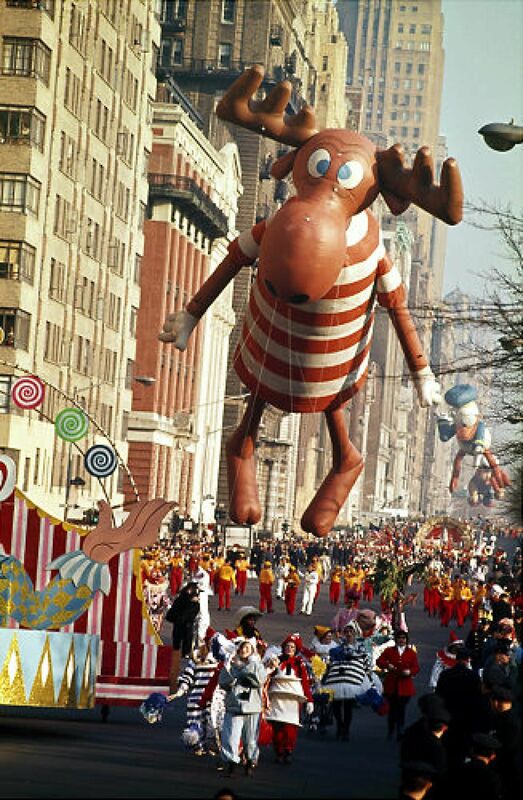 Many familiar Thanksgiving parade regulars were part of the event in 1975: both Underdog and Bullwinkle, mainstays of television syndication by the mid-’70s, were there in balloon form, although rough weather helped scuttle both Underdog and Snoopy. The six-year-old PBS series Sesame Street presented its second float ever, having debuted a year prior in 1974. And it was the final year ever for Elsie the Borden Dairy Cow, a veteran of two New York World’s Fairs. 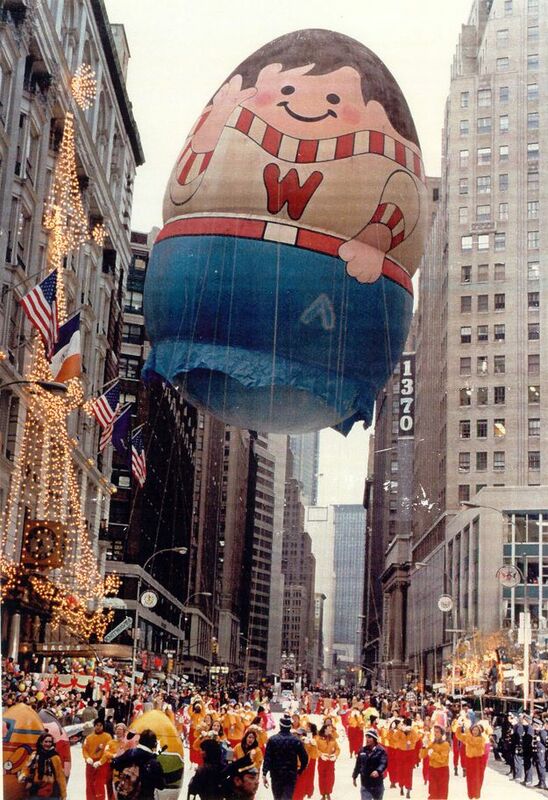 Three toys made their Macy’s parade balloon or float debut in 1975, toys that would become a seminal part of many a 1970s childhood: Weebles, Cooties, and Raggedy Ann. The Weeble toy first appeared in 1971, the omnipresent commercial jingle promising that these bottom-heavy, egg-shaped figures would “wobble but they won’t fall down.” The Weeble was created by Hasbro’s division for young children’s toys, Playskool, and marketed under the aegis of Hasbro’s Romper Room brand, which grew out of the franchised local daytime television program for preschool children. (Such cross-marketing ran afoul of citizen activist organizations like Action for Children’s Television.) Weebles had numerous playsets, including the Treehouse, a Haunted House complete with glow-in-the-dark ghost, and even a Winnebago-style vacation camper. The Weeble figure’s visual design is indicative of the organic, brightly-colored, post-mod-and-hippie 1970s aesthetic so common across graphic design, interior decor, and toy design during the decade. The Weeble balloon at the 1975 Macy’s parade shows off that homespun aesthetic quite well: a slightly androgynous, rosy-cheeked youth in a Weeble-branded sweater. 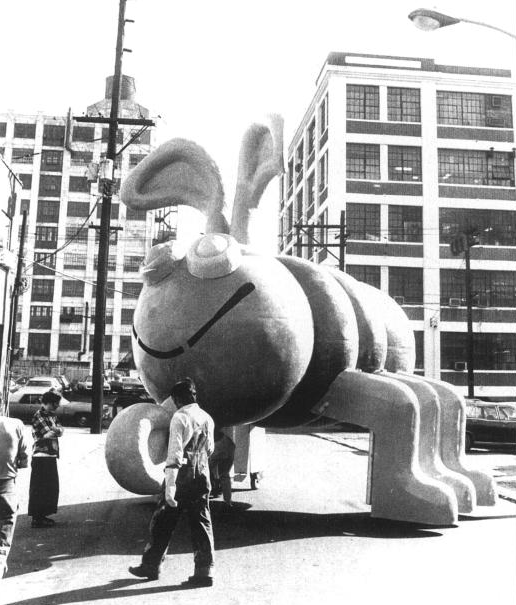 The Game of Cootie and its 1975 Macy’s float, on the other hand, go back a fair bit further. The game most of us grew up with has its origins in numerous pen and paper Hangman-like games, the word “cootie” itself having crawled out of the trenches of World War I. But it was right after World War II that Minnesota game company Schaper Toys developed a real-life Cootie game. The rising use of plastics in the postwar toy industry allowed William Schaper to turn his bug-shaped fishing lure into one of the biggest preschool games of the Baby Boomer generation. The Game of Cootie taught children numbers and basic fine motor skills, as they rolled a die to determine which part of the Cootie bug they’d assemble. In the mid-1970s, a new edition of the Game of Cootie was released with a cool, modernist, Helvetica-heavy box design. The giant metal Cootie float from the 1975 Macy’s parade now resides at the Shenandoah Caverns in their American Celebration on Parade exhibit. Raggedy Ann‘s origins stretch back as far as the cootie. Patented in 1915, the Raggedy Ann doll soon found itself the subject of a children’s book series by its creator, political cartoonist and illustrator Johnny Gruelle. (Raggedy Ann’s name originates from the same Hoosier source as another red-headed 20th century pop culture icon, Little Orphan Annie.) The resurgence of homespun toys like Raggedy Ann, as seen in this Thanksgiving float and several television specials in the late 1970s, points to a growing dissatisfaction among young Boomer parents raised in the plastic-fantastic 1950s and ’60s, when every toy was space-age, streamlined, and modern. The growing 1970s popularity of hobbies and crafting styles such as macramé, combined with a growing environmental awareness of what all that plastic was doing to the Earth, led to the success of toys like Raggedy Ann, and even influenced the big plastic-toy makers to try to tap into this new market of socially- and ecologically-conscious parents.